DePetro.com: Can Providence be saved? Storm clouds continue to circle above Providence while the finances of the city seem to be going from horrible to terrible. Panhandlers have been given the "green light" by Mayor Elorza to beg for more "$ green," while the number of empty buildings continues to grow with each passing day. The biggest news of the week in Providence was not a building be built, but a mob grave on Branch avenue being dug up. No " cranes in the sky" in Providence but plenty of FBI backhoes in the ground. If Mayor Elorza ever gets tired of being mayor, it seems his incompetent manner makes him a perfect candidate for a high paying job with the Raimondo administration. Sources tell me high level executives with Citizens bank did a polite walk-through on the potential of renting the " Superman building," and while under-whelmed by the building they were overwhelmed by the smell of urine surrounding the building. One executive said," We weren't holding our noses at the price, but literally holding our noses over the foul stench." How bad is it? Citizens bank would rather deal with the stench from the landfill in Johnston than deal with the mess of Providence. With the homeless treating the downtown area as a giant urinal, Kennedy plaza has developed an odor similar to the odor on I-95 when you pass the Warwick sewage treatment plant near the prison. The city of Providence should be put into a bankruptcy/ restructuring, yet there are still no planned layoffs or any major cuts in spending. So what is the mayors latest plan now that trolley cars are not happening ? The " Olneyville tunnel" which he promises will connect the illegals from the west side to the downtown area. When you recruit illegals from third world nations to come live in your city, they bring their third world habits with them. Just what the city needs: a mile-long homeless shelter underground. Hard to believe the 195-land sits empty as a giant mud pit of vacant land. 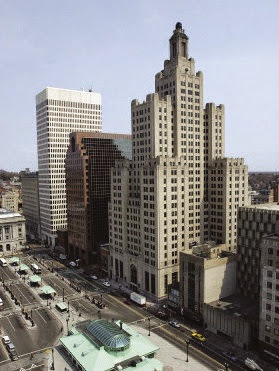 Providence is the home of high taxes, empty buildings, aggressive panhandlers, drug addicts, junkies, derelicts and illegal aliens. And that is just in the " knowledge" district. GE must be kicking themselves for choosing Boston over Providence, or perhaps maybe not. Listen to the John DePetro show weekdays on WPRO radio.